Tread Brite | Wrisco Industries Inc.
WRISCO’S Aluminum Tread Brite sheets service a wide variety of architectural and industrial uses. 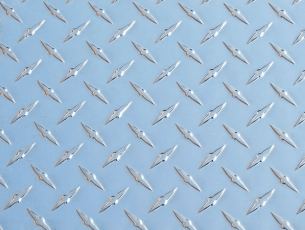 Whether it is interior or exterior, aluminum diamond tread brite sheet, being easily formable and corrosion resistant, always results in a high-quality finished end product. The textured diamond plate surface of Aluminum Tread Brite delivers anti-slip flooring surfaces, increased rigidity in the material as well as concealing dents and fingerprints. Aluminum tread brite sheets are an increasingly popular architectural design choice particularly for specialty decorative metal work in residential, commercial and industrial applications. Inventory includes .025, .045, .063, .080 and .125 gauges, all in 48” x 96”, 48” x 120” or cut-to-length in the size of your choice.